Gorgeous pillows. Love all the colors and the size works well in my accent chairs. The pillows bring the colors in the room together pretty good. 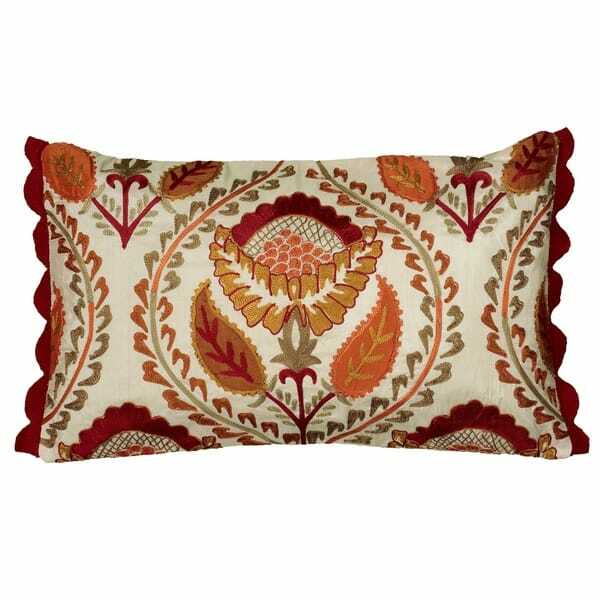 Rizzy Home combines refined elegance and vibrant earth tones in the stunning A21151 Botanical accent pillow featuring orange, brown, tan and rust embroidery in a botanical inspired accent pillow. An intricate flower and leaf motif adorns this beautifully designed pillow against a creamy background. This cover has a hidden zipper with a removable polyester insert. The perfect finishing touch to use as an accent in the bedroom, living room or any other room in your home. The durable weave of the fabric and the neutral design of the pillow allows it to withstand the test of time. Rizzy's accent pillows are created using the highest quality materials. Our team of experts work with a wide array of techniques including, applique, stitching, beading, embroidery and quilting to create a truly distinctive line. Rizzy Home is one of my favs of Overstock. While these pillows are very pretty with many colors, I choose other pillows from Overstock instead. quality, as always, very well done. There are burrs on the embroidered part . After a tmie these threads will get loose.